Inpats or Expats in Puerto Vallarta, Which Are You? A quality home valuation is essential in guaranteeing that your next acquisition is a solid investment. The valuation process begin with the numbers on paper, but in order to justify the numbers, a thorough property inspection (walk through) must be done. If you can correctly evaluate these 7 areas of any structure you will be able to nail your rehab cost, but I know you will miss the final one. 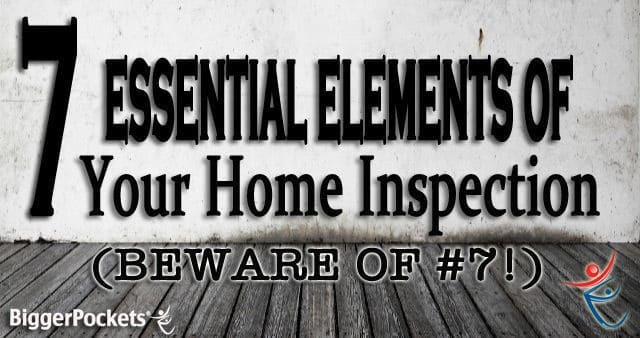 These elements are what keep the house functioning as designed. I normally refer to a home as having 3 levels: Mind (electrical), Body (foundation/roof), Soul (plumbing/heating/windows), by focusing on these areas will normally save you thousands. Mind– prior to entering the property, check the electrical panel box. Look to see if there is a circuit breaker box or a fuse box, this is very important because fuse boxes normally will not pass inspection in most cities, and insurance companies will not insure the property. Also if the exit strategy for the property is to find a retail buyer a fuse box is not acceptable according to FHA standards, thus limiting the buyer pool. Knob-and-tube wiring in houses that pre-date 1950 will be another source of concern. This form of electrical wiring is dangerous and very expensive to replace. If this type of electrical wiring is throughout the property it will need to be replaced. Many insurance companies will not insure a property with this wiring either. Knob-and-tube wiring is hazardous for 2 reasons: the wiring pre-dates 1950, and the wiring becomes brittle and breaks down which can result in electrical currents not being channeled correctly. In traditional electrical wiring the ground wire will channel that energy but because of the absence of the ground wiring in knob-and-tube wiring the current may cause a fire. Check the electrical circuitry thoroughly during the inspection period. If there are any doubts consult a licensed electrician. Body– Structural issues with a property can result in blown timelines. Many times I have witnessed investors not carefully checking the roof or the foundation. As you approach the property, the roof line should be what is being evaluated. Look for turned up or missing shingles, if this is evident be aware that there may be rotted wood or mold within the property. Dealing with a roof that is at the end of its life is very noticeable and if it is addressed immediately can save the budget and the timeline on a project. Foundation problems, on the other hand, can quickly scare any buyer; this is the most feared word when dealing with a rehab. If the resources to fix a damaged foundation are available, then getting deeply discounted properties with this issue will not be a problem. Signs to look for in damaged/faulty foundations: stress cracks in the garage slab, cracks in the walls and around doors and windows,. and doors that do not close properly can be found in properties with foundation problems. Often owners will say “the house is 30 years old the house is just settling,” this may be true but deep cracks mean something more major than settling. Soul– the soul is the heart of the home and this is the HVAC and windows. Windows are easily identifiable if replacing is needed. Windows add value to the property in 2 aspects; windows add to the appeal of the property or the lack there of, and the energy efficiency of the property. There is an ancient proverb that says “eyes are the window of the soul.” I like to say windows are the eyes of the house. If the windows are in good condition you can expect to have an efficient property. This is especially important for landlords, and mid-grade to luxury flips. Windows can save landlords money, and make a flipper lots of money. The HVAC systems are the lungs of the property, but I encompass this system with the soul. HVAC is important because it coincides with the energy rating and efficiency of the property. Always be aware of the the functionality of the furnace. First, try and find the manufacture date to see how old the unit(s) is. Secondly, see if it was maintained correctly, normally you can find this information by dates of inspection labeled on the units. If this is not visible, pull out the furnace filter, this will give an indication of how the unit were maintained. Following similar steps with the water heater (except checking the filter) is normally a good practice to follow.